UPDATE! We spent the summer and fall of 2018 collecting your input and combined it with additional research to create a comprehensive report on Lakewood’s residential trash collection system. We presented the report to City Council during the Feb. 4 study session. You can read the meeting summary below or watch the video online. WHAT'S NEXT? We will continue outreach efforts in order to develop more detailed scenarios for what a new system could look like in Lakewood. Check back here for opportunities to share your feedback in this process! We’ve closed most of the open discussions on this page, but if you have any questions or comments in the meantime, please email us at sustainability@lakewood.org. What are likely outcomes if Lakewood maintained the open subscription system, but added requirements for waste haulers operating in Lakewood? What are likely outcomes if Lakewood conducted a competitive procurement process in which contracted haulers operate in a specific district, and residents are assigned a hauler based on their address? You can watch the presentation and discussion online at Lakewood.org/CouncilVideos and selecting the Feb. 4 meeting video. As we dive into details around cost, services, and other system components, we will need your input! Stay tuned for opportunities to contribute your ideas, concerns, and values. 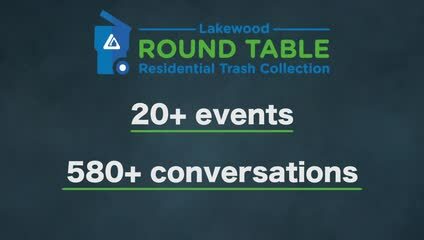 In June, City staff launched the Lakewood Round Table to understand residents’ concerns and collect suggestions on how the current residential trash collection system could be improved. This information was combined with research and summarized in the 2019 Lakewood Residential Trash Collection Report. Introduction (p.1): What is the objective and scope of this report? Community Goals (p.4): Why is this topic important to Lakewood? Research (p.6): What sources of information were used in this report? Community Engagement (p.9): How was the community involved and what did folks say? Issues (p.14): What are the issues with Lakewood's residential trash collection system? Goals (p.51): What does an ideal residential trash collection system look like for Lakewood? Options (p.52): What types of requirements could Lakewood implement to improve its system? Recommendation (p.70): Based on this information, what are the recommended next steps? Download the report to learn more and share your feedback in the comments section below. Related report documents are posted on the right hand side of this webpage. The report will be presented during the Feb. 4, 2019 City Council Study Session, which will take place at 7 p.m. in the Lakewood City Council Chambers located at 480 S. Allison Pkwy. You can attend in person and provide comment or watch online at www.lakewood.org/councilvideos. .
You can subscribe to project updates by entering your email in the "Stay Informed" box on the right hand side of the page or sign up for the Lakewood Sustainability e-newsletter at www.lakewood.org/sustainabilitynews to stay informed on all Lakewood Sustainability Division projects. What does an ideal residential trash collection system look like? CLOSED: We are analyzing all of your responses now! If you have additional comments, please email sustainability@lakewood.org. You've shared your concerns and ideas with us in-person, online, and in-print. From these comments, several key themes that we've summarized to describe Lakewood's ideal collection system, along with challenges that come with any potential change. Neighborhood-friendly: A minimal number of trucks collect neighborhood trash on only one or two days of the week. This creates a quieter, safer, and cleaner neighborhood. Affordable: Lakewood residents pay similar collection fees to other communities in the region, freeing up resources for other household costs. Business-friendly: Small businesses are able to compete with larger companies and continue contributing to the local economy. Transparent and accountable: Residents understand their collection fees and receive quality customer service. Environmentally-friendly: Cleaner and fewer trucks improve air quality and recycling is easy. Do you agree? Do you have ideas on how we can balance achieving this vision with the community concerns? Tell us by using the comment tool below or visit our Ideas page! Understand residents' opinions about Lakewood's current residential trash collection system for single-family homes and town homes. Collect ideas on how the system could be improved. Provide a summary of community concerns, opinions, and ideas and provide recommendations for improving the residential waste collection system. Staff presented the report of our initial findings during the City Council Study Session on February 4. Stay tuned for opportunities to provide feedback as we begin to develop scenarios to show what a new system could look like in Lakewood in terms of cost, services, and other details.